Florence Seibert made several important contributions to medicine during her long career. Most notably, she purified a protein from tuberculosis bacteria that became the international standard for tuberculosis testing. She also greatly improved the safety of intravenous injections by inventing a method to make distilled water free of contaminants that had caused serious problems in many patients. Seibert was born in Easton, Pennsylvania. As a girl she contracted polio; although the disease left her with a lifelong limp, it did not affect her academic skills. She graduated as high school valedictorian, earning a scholarship to Goucher College in Maryland. After graduating in 1918, Seibert briefly worked as a chemist at a paper mill. She then attended Yale University to earn a doctoral degree in biochemistry, graduating in 1923. During her graduate work at Yale, Seibert devised an improved method for making distilled water that eliminated bacterial contaminants that had caused fevers in some patients receiving injections with substances dissolved in distilled water. In 1924, following additional studies at the University of Chicago, Seibert became an instructor, then an assistant professor, at the Sprague Memorial Institute in Chicago. In 1932 she moved to the University of Pennsylvania, where she remained until retiring in 1958 as a full professor. It was at the University of Pennsylvania that Seibert began her important work in tuberculosis research. Robert Koch had reported as early as 1891 that animals previously infected with tuberculosis had a unique reaction when tuberculosis bacteria fragments or dead bacteria were injected under the skin. The culture extract used by Koch and others was called tuberculin, and the appearance of welts in response to the injection was called the tuberculin reaction. The reaction is due to an immune response known as delayed hypersensitivity and appears in humans who have either active tuberculosis infections or who have had active infections in the past. It is thus valuable to public health officials for identifying potential tuberculosis carriers. The preparations of tuberculin prepared by Koch and others, however, were complex mixtures of many substances, including the presumed active protein component, and the contents were not consistent from batch to batch. Thus the ability to induce the tuberculin reaction varied enormously from preparation to preparation. American biochemist Florence Seibert, who developed the procedure that isolated the crystalline tuberculin derivative, which is used in the standard TB test. protein she isolated was much improved over old tuberculin and was called Purified Protein Derivative (PPD). 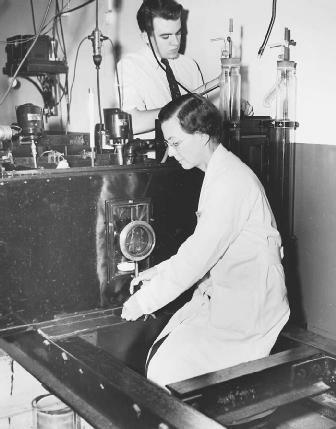 By 1940 Seibert had improved her protein purification procedure sufficiently for it to become the international standard for use in tuberculin tests, contributing enormously to public health campaigns. For this work she was awarded the Trudeau Medal by the National Tuberculosis Association in 1938 and the Garvan Medal by the American Chemical Society in 1941. Over the years Seibert's research interests evolved from tuberculosis to cancer research. Following her retirement from the University of Pennsylvania she became director of the cancer research laboratory at a hospital in St. Petersburg, Florida. In 1968 she published an autobiography entitled Pebbles on the Hill of a Scientist . Seibert continued publishing scientific research papers until 1977, when declining health forced her to give up research. She was inducted into the National Women's Hall of Fame in 1990, one year before her death. Hollingshead, Ariel (1993). "Florence Barbara Siebert (1897–1991)." In Women in Chemistry and Physics: A Biobibliographic Sourcebook. ed. Louise S. Grinstein; Rose K. Rose; and Miriam H. Rafailovich. Westport, CT: Greenwood Press. Long, Esmond R. (1958). The Chemistry and Chemotherapy of Tuberculosis. Baltimore: Williams & Wilkins Co.
Youmans, Guy P. (1979). Tuberculosis. Philadelphia: W. B. Saunders Co.